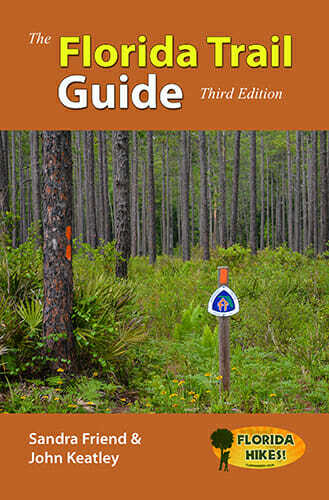 Now in its third edition in six years, our award-winning guidebook to the Florida National Scenic Trail provides comprehensive end-to-end coverage of more than 1,400 miles of hiking in Florida, a must-have for planning a long hike on the Florida Trail. We developed this guide with an understanding of long distance hiker needs after we spent several months backpacking the Appalachian Trail, and found The AT Guide an invaluable resource. Sandra had written four previous guidebooks to the Florida Trail, but we crafted this one after living through the planning process and day-to-day needs of hikers who spend more than a few days out there with a backpack on. It includes detailed logistics for resupply, places to stay, permits needed, and on-trail resources you’ll encounter. It’s not just for thru-hikers, however. Mileage charts, overview maps, and descriptions of significant waypoints along the trail let you sit and plan a day hike or a short backpacking trip as well. It’s also not just a book! A geolocated version of the information in this guidebook is available as an app for iPhone or Android through Atlas Guides. Using the GPS technology in your smartphone, the app works offline, showing you where you are on the trail and the resources near you. 356 pages, 106 maps. Sample pages shown on order page.